Strain the yogurt overnight. On the stove stop, combine maple syrup and blueberries and cook until the blueberries release some juice and soften. Chill completely and stir this into the strained yogurt. Add a splash of vodka. Pour into ice cream machine and then freeze. 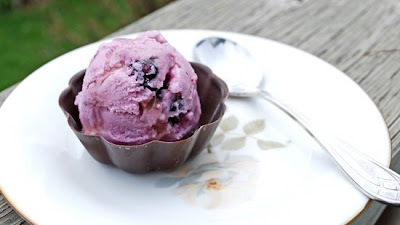 Posted by Brilynn at 1:09 p.m.
hmmm, maple and blueberry, a combo I haven't tried. Since I don't have an ice cream maker, I might start with this in a smoothie combo. Thanks for the idea! This flavor combination sounds amazing! The chocolate cup is a nice touch. Nice. I always add a splash of vodka to my homemade frozen desserts too. Maple and blueberry are really awesome together - very Northerly flavors! This sounds extra tasty. Bri, not only the flavors here are amazing, but also the color - so vibrant! Haha my husband always writes random funny haikus. Love it. I really need an ice cream maker. this is about as lovely as any other real icecream out there. love it! wow! I love froyos and this looks really awesome..
Blueberry and maple go together so well and this froyo sounds great!